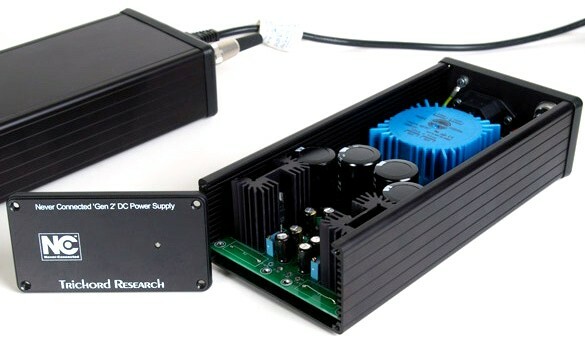 Send us your Trichord Dino+ PSU for access to this upgrade to the 'Never Connected' spec which is the ultimate power supply for the Dino MK1 and MK2 models. Your Trichord Dino+ Power Supply can be upgraded to NC Never Connected Spec which is the ultimate power supply for the Dino Mk1 and Mk2. 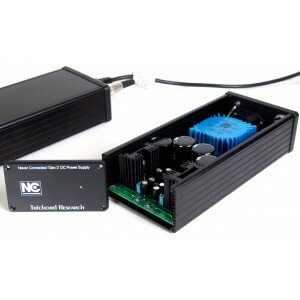 The NCPSU uses entirely different electronics to the standard 'Dino+' power supply. In place of the oversized toroidal transformer, there is a PCB mounting version alongside the cutting-edge noise reduction circuitry known as 'Never Connected'. Although the regulation circuit is physically connected to the incoming mains, it is disconnected electrically. A monitoring circuit detects the portion of the sine wave that is charging the first of a pair of electrolytic capacitors. Once this first capacitor is fully charged, the diode bridge rectifier turns off and a MOSFET switching circuit transfers the charge from the first cap to the second. This cycle is repeated continuously. It gets its name from the way in which the regulation circuitry is never electrically connected to the incoming rectified mains. This leads to a large and measurable reduction in mains borne noise enabling the Dino phono circuit to perform at its optimum. 'Never Connected' means low noise and superior musicality. A high performance connecting cable (replacing the standard one supplied with the +PSU and NCPSU) is available as an optional extra. You will need to send us your Dino + PSU before we are able to upgrade it to 'Never Connected spec'.